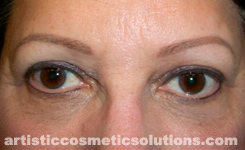 Can Permanent Makeup Be Corrected? Color Adjustment: This technique is used when the shape of the eyebrow, eyeliner, or lip liner tattoo is good but the color is poor such as orange, blue, or purple. 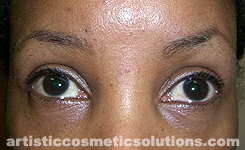 A corrective pigment color is implanted (tattooed) over the faded makeup to “neutralize” it toward a more natural shade. Usually the improvement is immediately noticeable, but it may take several weeks for the correction color to heal and stabilize to the desired result. Also, more than one appointment for corrective color micropigmentation may be necessary to achieve the best healed coverage. Shape Adjustment: Sometimes the shape of permanent or microbladed eyebrows, permanent eyeliner or lip liner is not “terrible”, yet it would look better with some changes. 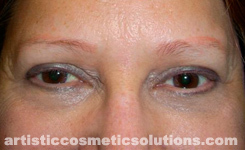 For these cases, additional makeup tattooing might improve the shape, symmetry or balance of the makeup. 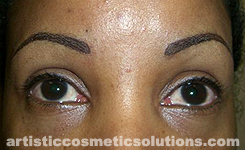 However, the tattooing necessary to correct the eyebrows, eyeliner or lips may increase thickness too much. Dr. Reed will demonstrate the changes with pencil, and then she and her patient will discuss the process to achieve the best looking results. If the extra tattooing will not look good, then the alternatives will be to remove some of the old pigment or do nothing. Can Flesh Colored Pigment Repair Mistakes? NO! Idaho does not require a license to do permanent makeup, nor does it regulate anyone operating a “school” or calling herself an “instructor.” If a technician or one of her students has made an error on your face, DO NOT let her “fix it” by tattooing over with flesh colored pigment! Flesh or skin-toned pigments are used for advanced medical micropigmentation services. They contain white titanium oxides and are opaque. When placed on top of permanent makeup, it looks unnatural because the skin in that location loses its translucency (transparency). (See photos below.) Even if the flesh pigment matched the skin tone well, the color would change over time. Finally, if you decided to have it removed by a laser, the laser would turn the flesh colored pigment black. The best options for repairing permanent makeup mistakes are cosmetic tattooing to adjust color and design and/or one of the removal methods.